When the weather is nice and the Rope Bridge is open, you will be able to cross the bridge for free! 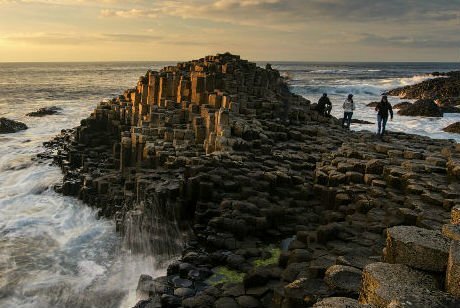 This Giant’s Causeway tour from Belfast is the best way to experience and learn about Ireland’s most impressive natural wonder. 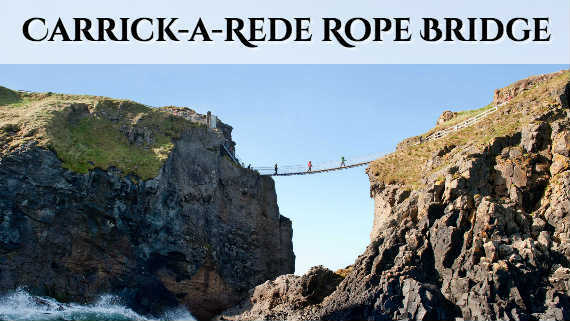 And because this is an incredible part of the world, we also take you to two other impressive places: Carrick-a-Rede Rope Bridge and the Dark Hedges! 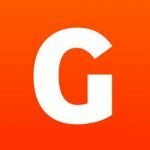 We manage to fit in our Giant’s Causeway tour and a visit to both the Dark Hedges and Carrick-a-Rede Rope Bridge in one day on this tour from Belfast. 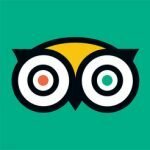 Book this top-rated tour today by using the booking calendar on this page. 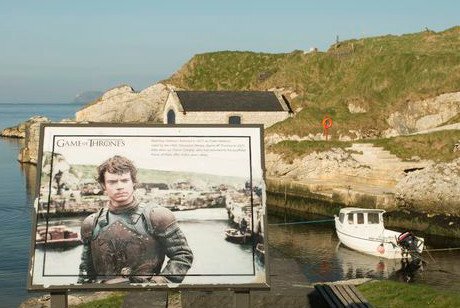 If you’re trying to see even more of Ireland while stay in Belfast, you may also like to check out our Game of Thrones tour from Belfast, or our Giant’s Causeway and Titanic Museum tour from Belfast. 0920 Boarding in Belfast, from outside the Top Shop entrance on Chichester Street. We leave at 0930, heading for the first stop: the Dark Hedges. The first stop is the Dark Hedges, and you will not be disappointed! The Dark Hedges are actually beech trees that were planted by the Stuart family, who wanted to impress visitors as they approached their Georgian mansion. This magnificent road of beech trees is now attracting half a million people from all over the world every year. 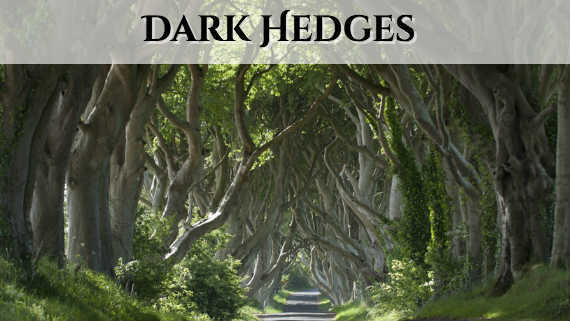 See for yourself why even the hit HBO series Game of Thrones chose the Dark Hedges to serve as part of the King’s Road. 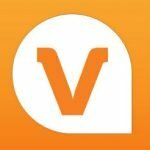 This is definitely a photo opportunity not to be missed! 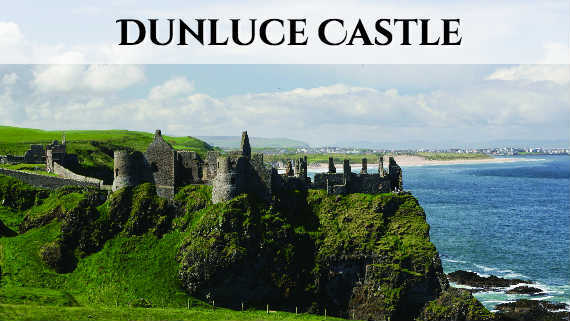 Constructed in the 13th century by Richard Og de Burgh, 2nd Earl of Ulster, Dunluce Castle is the most striking castles in Ireland. Once you have seen it in person, it will not be hard to understand why it has been featured heavily in popular culture. Appearing in Led Zeppelin’s album, Houses of the Holy, American musician Jandek’s album, Glasgow Friday, Jackie Chan’s movie, The Medallion, to name a few. 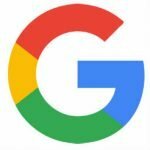 It is also said to have been the inspiration for C.S. Lewis’ The Chronicles of Narnia. Licensed since 1608, there is no doubts why Bushmills whiskey is arguably the best whiskey in the world. As Bushmills Distillery has stopped giving out a free shot of whiskey at the Distillery since 7 Sep this year, we will not be making a stop there anymore. Without the free shots of whiskey, the Distillery is only an overpriced gift shop. As everything (including the whiskey) they sell in the gift shop can be easily found in Belfast, we will instead add this time onto the tour so you can have more time at the other stops. Our guide will still be sharing with you how they make whiskey in Ireland and whisky in Scotland, though. If you would like to take a truly exceptional whiskey tour, however, you may enjoy our Jameson Distillery tour in Dublin. The Giant’s Causeway is the highlight of the day and Northern Ireland’s most popular visitor attraction. Look forward to breath-taking sights, fascinating hexagonal columns, and unforgettable landscape of the 8th wonder of the world. There’s something so surprising about the Giant’s Causeway; it almost feels as though you’re on an alien planet. 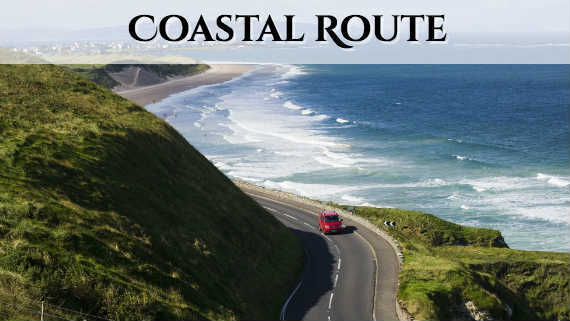 At this stop you will be given the opportunity to glimpse the Irish landscape, sometimes even the White Park Bay, at its most idyllic: beautiful rolling hills, magnificent seascape and of course the hexagonal/ polygonal stone columns that form the legendary causeway itself — some of which reach 40 feet into the air. Formed in the aftermath of an ancient volcanic eruption, as the lava hit the cold North Sea, the Giant’s Causeway consists of approximately 40,000 interlocking basalt columns. Although this odd stone pattern stretches all the way to Scotland, nowhere is it more perfectly preserved, making it one of the top places to visit in Ireland. 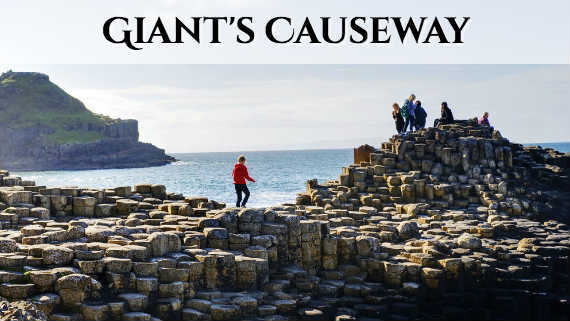 According to local legend, the Causeway was formed when an Irish giant named Finn McCool ripped the earth from the ground, creating a pathway for a rival giant. Outwitted by McCool, this giant (named Benandonner) ran back to Scotland, wrecking the earth as he went. Despite some scepticism from pesky scientists, the existence of similar stone formations at Fingal’s Cave in Scotland are said to be proof positive for the legend of Finn McCool. Although the bridge in its current form was constructed in the year 2000, it is believed that rope bridges have been used as a means of reaching the island for more than 350 years. The fishermen used to use the bridge to harvest salmon as the inlet confused salmon into thinking it was the mouth of a river. This allowed the fishermen to catch tremendous amounts of salmon, and the salmon population in Ireland actually suffered significantly! The bridge has taken many forms over the years, and in the 70s it consisted of just one handrail with large gaps between the slats. At least the modern version is a little safer! 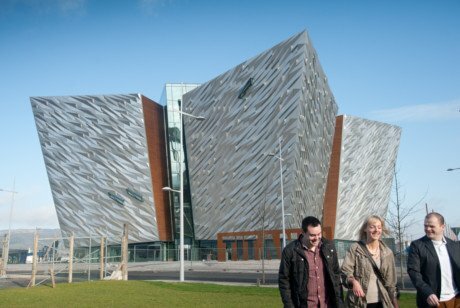 **As people don’t want to spend that much time in the cold countryside, when it starts getting cold, we might give a little bit less time at the Giant’s Causeway and add the time onto the Belfast stop. 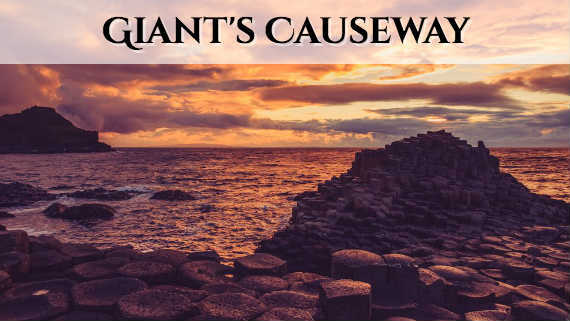 If you have any questions about this Giant’s Causeway tour from Belfast, please feel free to contact us here at Finn McCools Tours. We’re always happy to chat to people planning a trip to Ireland. Yesterday we did this tour with guides Andy and Daniel. They did a great job, told things about the history of Ireland and North Ireland but not too much. We got plenty of time everywhere and sometimes there was music in the bus. Just fine. One of the best excursions we ‘ve had in the world because of the tour guides. We had amazing time with Iriel and Peter. The tour was full of nature and fun. Giants Causeway is incredible experience. Highly recommend. 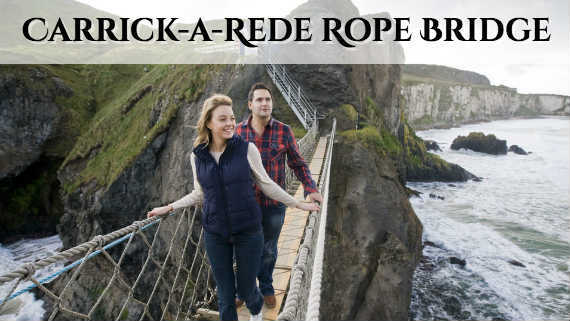 We thoroughly enjoyed this tour to the Giant’s Causeway and Carrick-a-Rede Rope Bridge. On our way to Northern Ireland, Tour Guide Gavin gave us interesting and often humorous information about the locations through which we were passing, famous people from these areas, and a primer on “The Troubles” experienced in Northern Ireland for many years. The Giant’s Causeway is a pretty good walk from the parking area but well worth it to see the hexagonal outcroppings of rocks that look other worldly. The rope bridge was interesting – being suspended hundreds of feet above the ocean is quite an experience. On the way back to Dublin, we stopped at the Dark Hedges (AKA the King’s Road from Game of Thrones). Capt. John did a great job getting us there and back again. My best friend and I took the tour a little over a week ago. This was such a great way to hit up some gorgeous views of Northern Ireland, no matter the weather (we had rain, but smiled all day) The tour was organized; our guide, Derrick was great (the road trip playlist was perfect and included some live songs) and Peter was a pro at navigating the roads and getting us to our spots safely. I enjoyed learning more about Irish history, as Derrick was informative, pointing out any cool sites along the way and places to check out once back in Dublin. I highly recommend the tour and I’m so glad we booked it!